Consult the Sizeguide to determine which size you should purchase. BUST: Measure around the fullest part of the bust, keeping your elbows tucked down toward your sides.WAIST: measure across smallest point. Bend to one side to find the natural crease of your waist. HIP: Stand with your feet together, measure around fullest part of your hips and rear Still in doubt? Please do not hesitate to contact us! 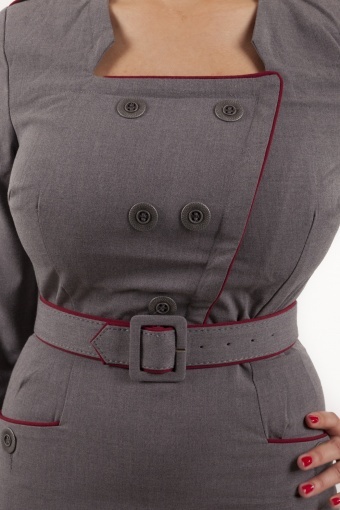 The 50s Military dress in grey by Bettie Page Clothing. Get the Boys to Salute you in this bombshell of a dress! The military theme is huge this Fall and TopVintage rides to the rescue with the coolest expression of the trend! The Military olive dress is fully lined, constructed of 4-way stretch fabric and boasts adorable kick pleats in the back! The non-functional military style buttons and the front pockets combined with the back zipper to make this wiggle dress not only captivating, but so comfortable, too! The brass buttons are the perfect touch to our Military in Olive which has red piping accents and a matching belt.